Tiyamike is 15months old. She was born prematurely on October 19th 2017 weighing just over 4lbs. Her 22 year old mother hemorrhaged after her delivery and died the same day. 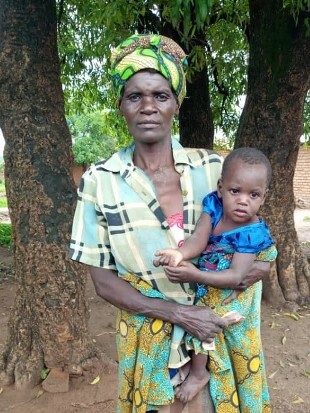 As her mother’s body was loaded into a vehicle to transport her back to her village, her grandmother was handed a couple tins of formula from hospital nurses. The tins were likely provided as a donation from a kind-hearted individual and stored in the nursey for such events. There was no additional support to the bereaved grandmother, no promise of future donations or follow-up appointments. Tiyamike’s family live in rural Malawi, they are subsistence farmers and did not have the means to purchase additional formula. Her grandmother is illiterate and does not speak English anyway. She was unable to read the instructions on the formula tin to verify what she understood from the brief instructions provided by the nurse. The day a squall of grief rattled every cell her being, she needed to absorb and process very specific instructions on how to keep her grandchild alive. She did her best. On November 6th, Tiyamike’s grandmother returned to the local hospital. In the two intervening weeks Tiyamike had lost weight and was now emaciated, significantly below her birth weight. Her grandmother was referred to our program with Joyful Motherhood and our nurses have been visiting them regularly ever since. Life is hard for Tiyamike’s family, their survival rests on their own physical labor and the capriciousness of weather. But, they have love, determination, and support from JM. Now at 15 months, Tiyamike is a normal joyful and busy toddler.